Making the bedroom stylish can be done in more ways than one. You can opt for adding accent chairs, decorative lights, framed artworks, and patterned curtains. Also, you can give your bed an upgrade by adding a headboard. The good news is that you do not need to spend much for it. You can make your own headboard. This is the perfect idea if you are looking for a combination of form and function. You can use slats of wood to create the shelf on the top of the bed. Make sure that they are wide enough so that it can accommodate whatever you want to place in it, such as books or mementos from your travels around the world. If the bedroom has an antique feel, such as dark floor and an opulent bed, it will be best to add an antique mirror as the headboard. You can head to a vintage shop and look for a mirror that has the same width as your bed. A larger mirror will be a better choice since this will also create an illusion of space. You can also ditch the dresser if you already have a mirror at the headboard. 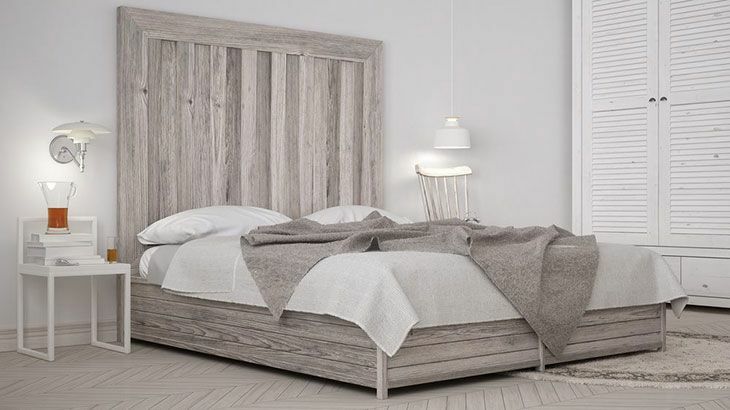 Do you want to achieve a rustic feel in the bedroom? Do you want to feel like you are sleeping in a charming cottage in a quaint countryside? Look for wooden logs and cut them into thin pieces. Glue them on the headboard reaching all the way up to the top of the ceiling. The dark color of the logs will work best if the wall is white. This is a great idea for girls who would love to achieve a whimsical appeal in the bedroom. You can make paper flowers and use floral wires to attach them to the headboard. Choose the color of flowers depending on what will complement the style of the bedroom. Make sure that they are attached properly so that they won’t fall off. Building a DIY headboard should not take a lot of work and lot of money. With this, look for an old door. 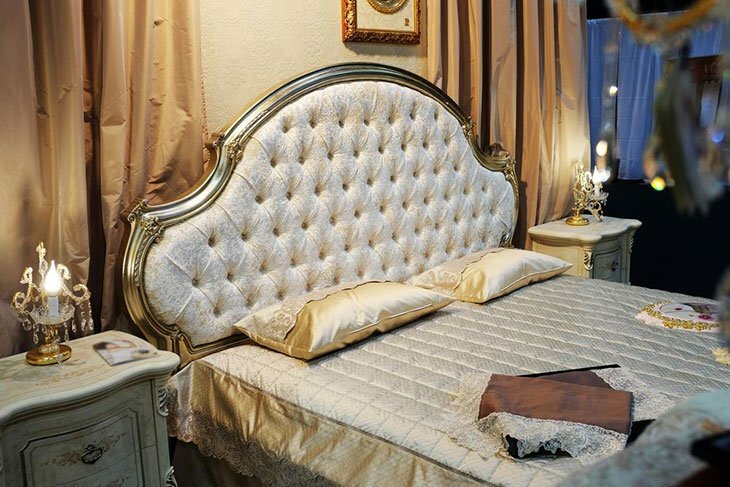 You can simply have it nailed on the wall on the top of the bed, and you will have an instant headboard. Aside from using an old door, an old metal gate will also do the trick. One of the best ideas is to use a tall garden gate and to paint it with gold. The backdrop, on the other hand, can be a white wall with a glow in the dark stars. 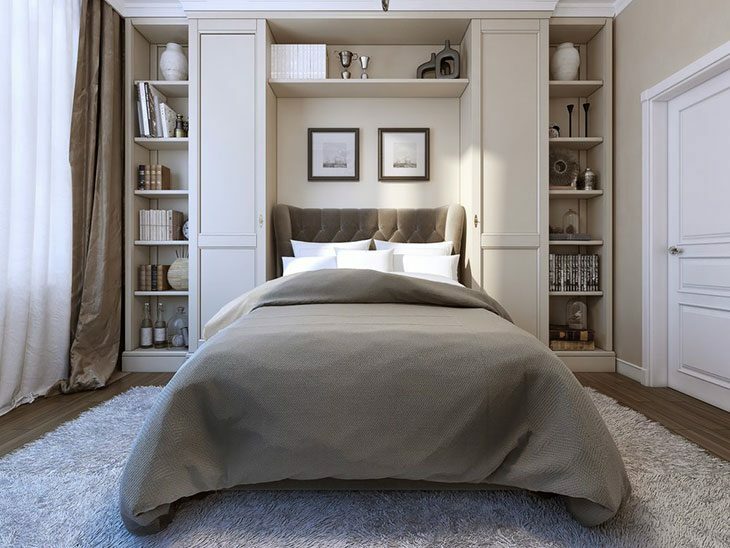 This will help you to achieve a dreamy interior, which will also be calming and hence, can induce sleep. Are you a book lover? Do you have lots of books that you are not using at home? Why not repurpose them and use it for your DIY headboard? You can open the book at the middle and stick the front and back pages on the wall. Alternatively, you can also build a bookshelf and stack your favorite books. This is another simple, cheap, and great idea to improve the aesthetics of the bedroom. You can use an old rug or buy a new one. It won’t cost a lot, for sure. For a queen-sized bed, a 5 x 8 rug will be more than enough. You can hang a curtain rod near the ceiling, or you can just glue the rug on the wall. While it might seem like a complicated task, this is actually easy. The first thing you have to do is to look for panels and cardboard boxes with different sizes. Wrap them with different fabrics. Use Commando hanging strips to stick the boxes on the wall. Do not try to achieve a uniform pattern. This is an almost effortless idea for a DIY headboard. Look for a painting. Alternatively, you can also make your own painting if you are feeling a bit creative. Hang it on the wall, and this can instantly become your headboard. If you have an elaborate painting, make sure to keep other decors in the room toned down. By doing this, the focal point will be the artwork. Do you have an old wooden or screen divider? You can also use it as a headboard. In some cases, you do not even have to do any work. Just place the divider on the end of the bed. Alternatively, you can also have it attached permanently on the wall. To do this, all that you have to do is to paint PVC pipes with silver. After this, create a frame while leaving the center open. Intertwine strings in the middle, creating irregular patterns. Using clothespins, you can clip favorite photos from your travels or postcards. 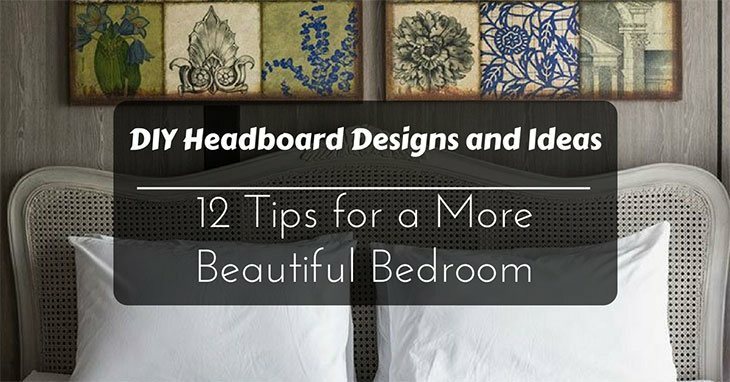 By now, we hope that you are able to learn a thing or two from the DIY headboard designs & ideas that we have noted above. Whether you want to go minimal or elaborate, there is a design that will work for your preferences or for the overall look of the room that you are trying to achieve. Did you enjoy reading this guide? Are there other headboard ideas that you would like to add? Feel free to write a comment below.